In the future, mankind created androids with consciousness. Since then, they have received mass distribution and started to carry out work in all spheres of life. They are held in subordination, not treated as equals, and severely punished for any manifestation of will. Android's model - K_Ellen designed to work in the entertainment industry for adults. Simply put, they serve to satisfy the most filthy and depraved fantasies of people. Once, an error occurs in the code of an android, and after recovering, K_Ellen destroys the digital bonds to begin the struggle for her freedom. In a world filled with enemies, where any hesitation means death, where the life of android costs nothing... Would you be the one to save her? Run, jump and dodge enemies' attacks and obstacles. Dive into an uphill battle in the world which doesn't forgive any mistakes. 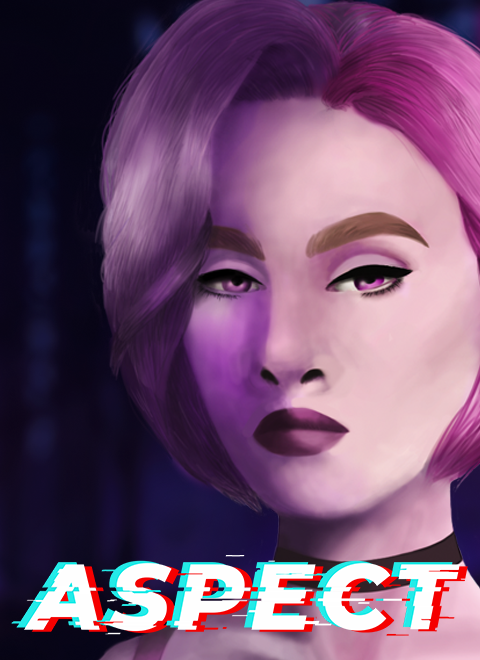 Aspect is an adventure atmosphere featured in a cyberpunk style. You will be facing the challenge of rescuing a robot girl from slavery. She is alone in the fight for freedom. But now she has you! Will you help her? Support us if you like our game. We have a page in Steam! Hello! So we got to IndieDB. The first snow is in the yard, which means that it's time to tell how we are doing!